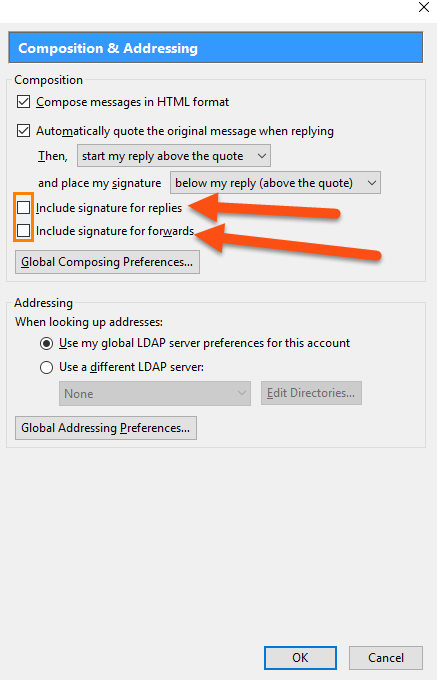 Recently I have been wondering how I could get an eMail signature to appear in replies and forwarded eMail. When I write an eMail, the signature is always there, but when I’m responding/replying to an eMail, it is not. This is frustrating when I want people to always know the who, where and how to contact me. Plus, it looks more professional, in my opinion. Right now I have a Name, Title, Phone, eMail Address, Website, and Business Address in the signature. Now, every time you reply to or forward eMail in Mozilla Thunderbird, your eMail signature will appear. This will make sure everyone knows you mean business. I have been trying to reproduce the same issue you are having with no avail. It has been working with the HTML signature files, html signature text and basic way I explain in the article on my end. I have tested it on 2 different computers running the same version of Mozilla (45.3.0). So I’m guessing your signature shows when sending emails? I did check my view settings and turned on plain text view. This made my signature show the default text only. So you might check that option to make sure it is set to view HTML. Go to “View | Message Body As | Original HTML”. Since I do not know what you have tried I want to give you some options. Might be the image file location causing some issues. Is it saved online or is it saved in your computer? The image source that is. I would suggest going to our forum and posting your question there. We have many others that might be able to help you with this issue. Here is the link https://davescomputertips.com/forum/everything-else/ . Most of the time these issues can be just a setting that is different or an update from Thunderbird that causes the issue. Hate not being able to figure why it works for me and not you. Keep me informed if you find the answer. I will keep thinking on this and if I figure it out I will let you know here. Thanks for your comments – the image file is a fairly small one that was saved in My Documents and referred to in the signature area for Thunderbird – for replies and forwards as well. However following your comment I decided to try changing the location of the file and put it in users……..AppDataThunderbird – referenced from there it does work now for replies and forwards – as you can see below. I have no idea why the original location worked for new messages but not for replies/forwards but it was your comments that led me to a solution so thank you computers eh! As long as it helped you out in some way or form that makes my writing worth it. In my business I want to make sure all my info is front and center. Netscape became the Mozilla Suite (including integrated browser, e-mail client, composer, and messaging) and, when Mozilla decided they wanted to separate the browser (which became FireFox) and the e-mail (now ThunderBird), a group of developers decided they liked the “suite” idea better, and started SeaMonkey, picking up where MozSuite left off, but keeping the basic Gecko kernel. Some time later, Mozilla decided they wanted to concentrate on FireFox, so ThunderBird also became a spin-off. Many FF extensions/addons work for SM, as-is or with some conversion. At least my article triggered a memory and that is a win to me. The best thing about writing these articles is having readers like you share their knowledge. 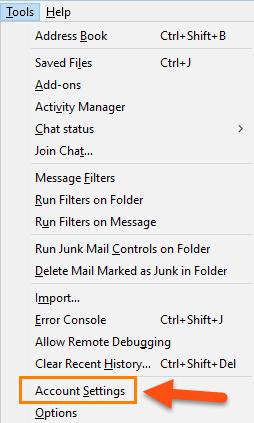 I would have never known about the history of Mozilla Thunderbird or the SeaMonkey Suite. Thanks for the info Alexander. But isn’t there a school of thought that we should NOT include a signature repetitively in an ongoing conversion?? 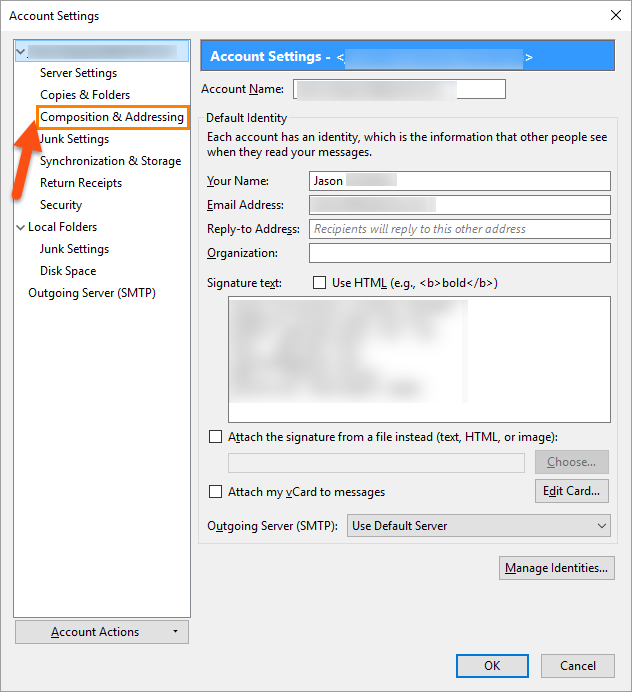 I recently changed my settings to automatically include signature on New Messages only. For Replies or Forwards I click to insert manually. In an extended conversation I only do that on the first Reply. Which is why I wanted to achieve the opposite result, as I deswcribed in my reply to Jason Shuffield — but, for a few cases where I know I can trust the recipients, the signature may be appropriate. I’ve tried this, but my signature block isn’t showing up on replies or forwards, even though the boxes are checked. And I’m just trying to use basic text. Any ideas? Not to sure why it is not showing up if you checked all the boxes. Make sure everything is set the same way from step 6. When you are doing a reply is your signature showing up at the very bottom or somewhere else? I found that my signature was placed in a spot I did not notice. Also make sure to update your Thunderbird by going up to the Help option and clicking on about Thunderbird. This is where you can see what version your on and update it. Alot of the time it is an update causing the problem. If these do not work head to our forum someone might be able to figure it out for you https://davescomputertips.com/forum/everything-else/ Just start a new topic with exactly what is going on.